Seems like people have been talking about the age of digital magazines ever since the internet became a part of daily life. But why are there are so few succesful players in the market? Why are so few of them purely digital? In this post I will try to argue that it just hasn’t been done right by enough publications. There are too few success stories. A few years back we saw Apple Books and Amazon take a leap forward with iBooks, iPad and the Amazon Kindle Newsstand as ways to read not only books, but magazines. We also saw services like ISSUU, iPaper, FlowPaper and Flipsnack popping up to standardise e-publications by making PDFs easy to release on a universally available platform. But in my opinion, none of these cater to the magazine reader in a way that really sets them apart from print. I will quickly add that these services are a source or progress in the area, and certainly convenient for both publishers and readers, but they haven’t quite hit the nail on thread… yet. The major issue I have with these services is the walled-off proprietary nature of the files and their availability. In order to access a digital publication released on Apple’s platform, I have to use an iOS device, have an iTunes account, and use their platform to acquire the magazine. The same goes for Amazon. These service allow for a high level of technical fitness to be put into the publications -they can be interactive and responsive. But it’s all wasted work when it gets locked up in these closed channels. If we were to simply skip the middle-man and release our magazines as web sites, we’d be accessible to all. 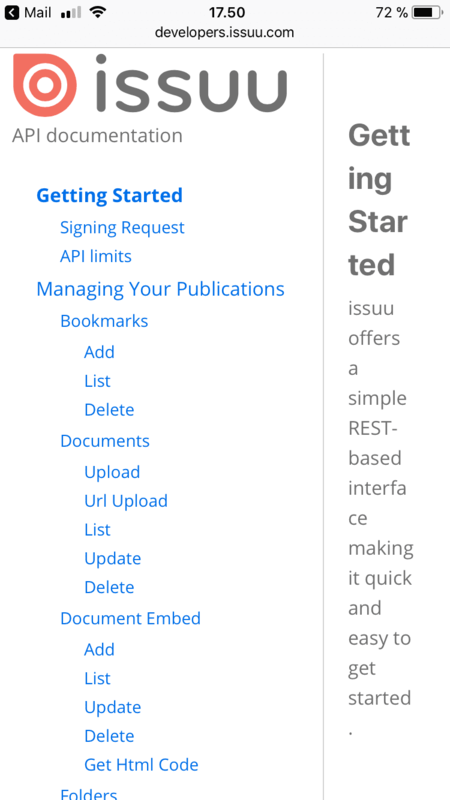 I want to say many good things about services like ISSUU, so let’s start with the good parts. 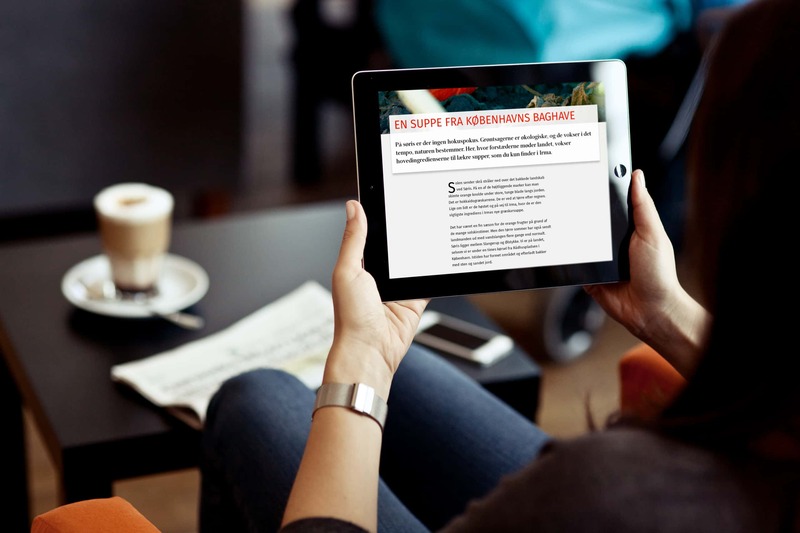 Whether you make a small newsletter for a club or a large international publication, you can find advantages in releasing as PDFs. 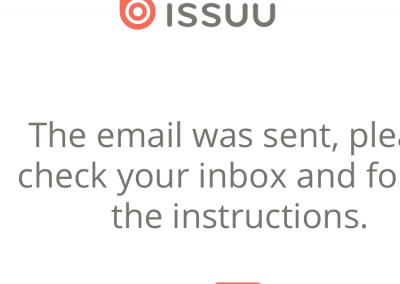 First of all, you can take your magazine (probably already produced on a computer) and upload the resulting PDF to instantly make it digitally available. They even look exactly like the printed version. You can also enrich it with HTML areas for advertising or other dynamic content. You can even ensure any links mentioned in the magazine are clickable, the table of contents can link to each article, and you have the option of making the entire thing searchable. So far, so good. But what if you’re a reader? On the plus side there’s this wonderful universe opening up for you where you can browse, search and read thousands of magazines, and they’re all available right there on your smartphone, tablet or laptop. Butthe second you want to read the rest of that PDF on your iPhone’s ISSUU app, you realise that it’s like reading a book through a keyhole. The fonts sizes, images and layout are just not optimised for you device. The same could easily be said of reading some ISSUU publications on an iPad Mini, where you’ll need to zoom in and out constantly to find your way around and read the text. We’re also very much stuck in the per-issue, linear page-by-page way of reading that is mostly a leftover form the physical paper world. At first you like the novel idea of flipping through pages “just like real magazine” until you find yourself asking… why? Magazines are laid out in a linear fashion, page by page. But on a website you could essentially read the contents in any order you choose. The table of contents is just a click away, so rather than flipping pages to find something you could simply jump there. If you find the subject of articles interesting, you can read more related articles from other issues, and depending on affiliation, even other magazines. Good luck reading this on a smartphone. This is a default view on an iPhone of a 2-page magazine spread. Not only is the impact of the spread lost by limiting me to only half of the image, I also won’t be able to read any of that on a tiny screen. If I zoom in to read, I’m basically trying to see the big picture through a keyhole. Ple check your inbox and fo the instructions? 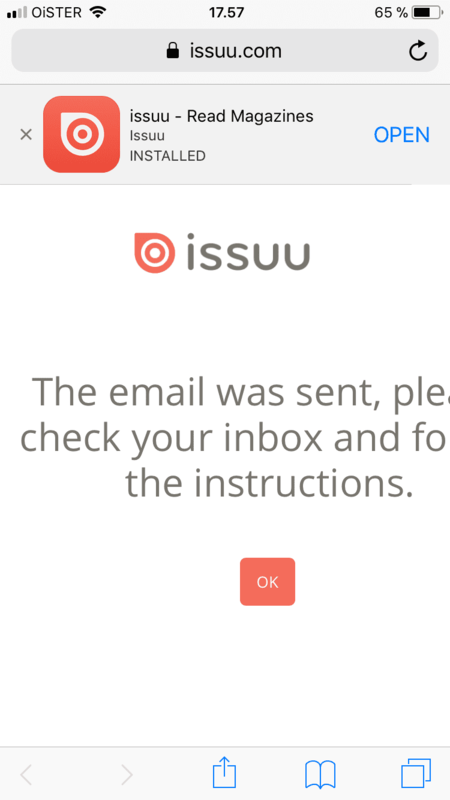 This is what you see after subscribing to ISSUU on an iPhone 6S. They can’t even get their web page to display correctly on an iphone, let alone their magazines! The best reading experience possible? 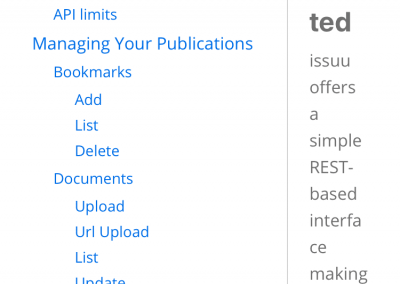 Let’s take a look at the documentation on that reader-friendly API. … or not. This is what it looks like on a smartphone. 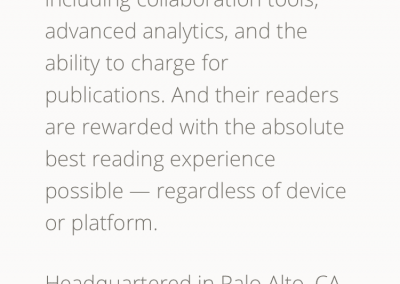 It’s unfortunate that a company that prides itself so much on reading experience does so little to ensure it. It’s all about understanding that this is something designed to be read and interacted with. If you put too much attention into the reading experience you end up with something less exciting than the real thing. It basically becomes text, and at most the few images needed to support that text. If you put too much effort into the interaction, the user will be distracted and annoyed by all the buttons, links, animations and banners that fight for visual attention. What is needed is a balance that puts content first. We need low amounts of clutter in the layout. As much as possible, every option that is not directly related to the task of reading/viewing images should be collapsed away behind closed menus. We also need to work with low contrast to ease fatigue, rather than using black tekst on white (or my personal dread, white text on black) we should be using a background and text that offers less contrast. Offer the reader some of the advantages digital has over print. A mobile-first approach to design. The essential interactions and information should exist here, while the nice-to-haves get added as more screen real-estate becomes available. 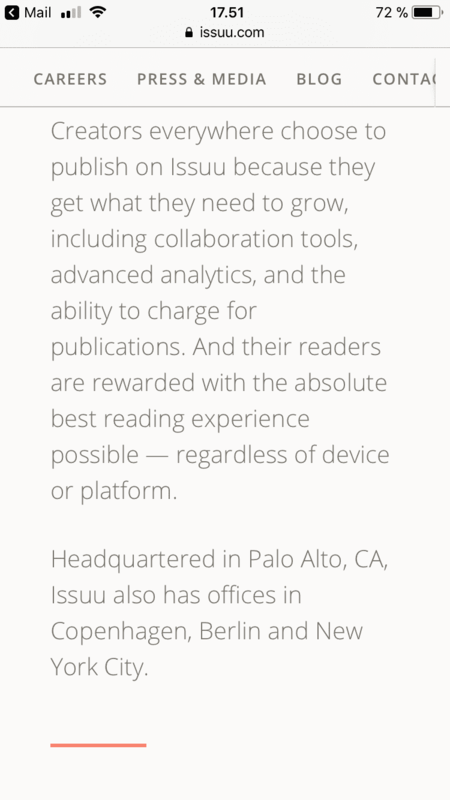 Legible text on any screens through the ability to enlarge text to whatever size the reader finds comfortable. Pagination allowing for less scrolling on small screens. Progress indicators so the reader knows how far they’ve come in the article. My favourite example is “Scroll Position Indicators” developed by Zachary Olson (notice them the right edge of the screen)- I really think he nailed it especially with the added hover on each dot, allowing the reader to jump to sections. The hover function needs a workaround for touch-screen devices, but it can be worked out. There are plenty of good alternatives to this idea, like simple progress bars at the edge of the screen. Integrate an option to paywall. Instead of the old fashioned method of subscription to ‘all or nothing’ you could offer readers all manner of subscription options to fit there needs, as well as making certain/older articles free, single-article unlocking etc. Images should crop using a focal point, making it much easier to build responsive layouts without worrying to much about the important parts being cropped off. There are plenty of these modules around for most CMS systems, but too few are using them. Images should be “zoomable”. All of them. If you wish to use a mix of large images and small ones knitted into the flow of text, that’s beautiful! Go ahead! Printed magazines do this as a part of their design, but it also serves a purpose. You can relate images to what is being read at the given moment, and it also allows you to break the monotony of just reading columns of words. But allow the reader to take a closer look, always! Search options. Search the current article, the whole issue (if you still want to make issues) or the entire catalog. This is one of the biggest strengths digital has, one of the major advantages. Don’t just write! Use video where needed, use audio where practical. Use the best media for the subject. Why would you read an interview with Morgan Freeman when you can hear his amazing voice? Why only read about a beautiful vacation destination when you could say much more with photographs? Why make an infographic with tiny details when you could use an interactive one that actually gives the reader a better, simpler way of viewing data? Look at offline storage options. Maybe you could find a way to generate a progressive web app from an articles so users can read when offline? Use data well. You need to think about taxonomy, themes, subjects, and how they are used it printed magazines (hint: often very badly). Are they relevant to digital, and if so how will you use them? You need to think about all the little bits of information relating to every article, and how to offer your readers practical power options (remember to keep it simple and mobile first). If I click on a reporter/journalist/author’s name, should I get a profile for that person and a list of all articles they’ve written? If I click on a credited photographer, should I be abe to see all photos by that photographer in this magazine? You need to think about a set of rules for how you tag articles for generating lists of related articles -and you need to look at how this is different from using themes or subjects to do this. This was a list of some of the ‘essentials and optionals’ I would consider when designing a digital reading environment.